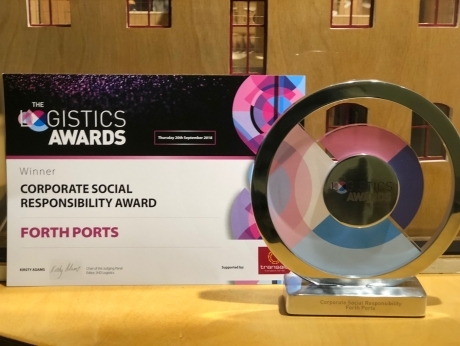 Forth Ports Limited, one of the UK’s largest port groups, has for the first time won the Corporate Social Responsibility (CSR) award at last night’s Logistics Awards 2018 in London. The independent awards celebrate logistics industry excellence across a range of areas with Forth Ports being praised by the panel for their many community projects and skills development in the UK. Across the business, corporate social responsibility is key and is part of the commitment to the legacy the ports have with their communities. Forth Ports supports many community projects across its locations around the UK including Tilbury in London and Grangemouth, Leith, Rosyth and Dundee in Scotland. The business has a strong commitment to community engagement and building networks within its own workforce and with local people. Forth Ports has achieved success in the development and up-skilling of its own employees, through an award winning Logistics Training Academy in Tilbury. In addition a new Skills and Business Centre will open this year in Scotland. Last year 652 training and plant skills courses were delivered with 2327 people attending the courses throughout the group. Forth Ports also engages with local schools, colleges and universities by providing experience days, internships and work placements. Forth Ports is proud to support many charities and community events that deliver local benefits. Forth Ports has also invested in major local projects such as Tilbury on the Thames Trust (TTT). TTT has a board of six trustees from Forth Ports and the local community, bringing expertise in skills and training, regeneration and local community knowledge together. Forth Ports also works with the armed forces and DWP Trainees to give them the skills to return to the labour force.